Following on some of the thoughts in the previous post, I thought I'd go on a bit more about tools. I like to support my local hobby shop, hopefully that means he'll be there when I need him in the future. (There's another topic for a rant). When I went in a while ago to resupply X-acto knife blades all he had were the "Proedge" items seen above. He assured me that they were of the same quality and a bargain to boot. So I plunked down my $22.75 plus taxes and wandered home. Well... Never again! The cutting edge was poorly honed. I could feel dragging and grabbing as I cut and they snapped at the shank whenever I applied a reasonable amount of pressure. Never mind that the tip snapped off with very little pressure. I was chewing through these blades at 5 times the normal rate. Given that I can go through 2 boxes of premium blades a year, this was not a bargain. Lesson learned, again. No more cheap tools. Ever! For those of you who do not read Railroad Model Craftsman, below is an editorial I wrote that was printed in the last issue of RMC. What you'll get here that's not in the magazine is photos of the old layout taken by my good friend Trevor Marshall. 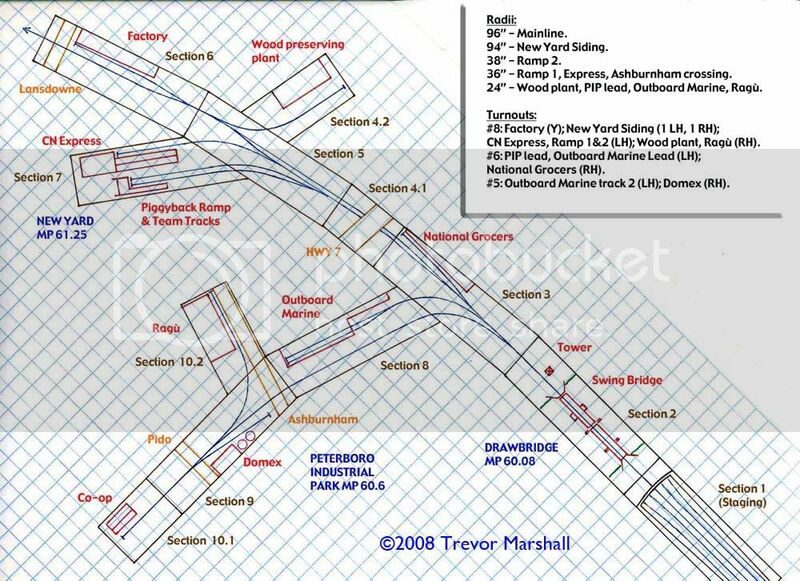 An overview of Palmerston yard. What's not built yet is the other 2 legs of the wye. It would have been to the right in this photo. Look carefully towards the top and you can see the beginning of the leg. It was this wye that in the end caused all the trouble. It cut the room in half and made the space unpleasant to be in. The wye was essential for the operations. I had a great time building this coal dock. I had a few know dimensions and lots of photos. Sadly when I tried to remove it from the layout as I was dismantling things, it got badly damaged, to the degree that it wasn't worth repairing, otherwise I was going to give it to the museum in Palmerston. A couple of pieces of motive power. 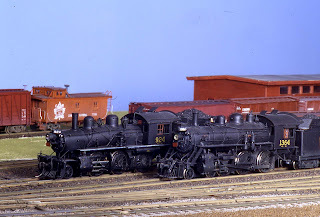 At one point I had 16 steam locomotives ready to roll. Fear and Loathing in the basement. 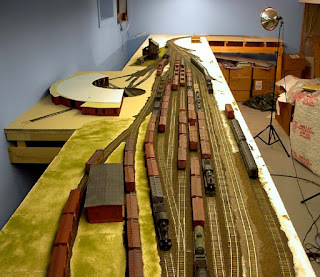 No, this is not another piece of gonzo journalism, but rather an essay about attitudes and abilities as it applies to model railroading. But I do wonder what Hunter S Thompson would say about us at times. But I digress. 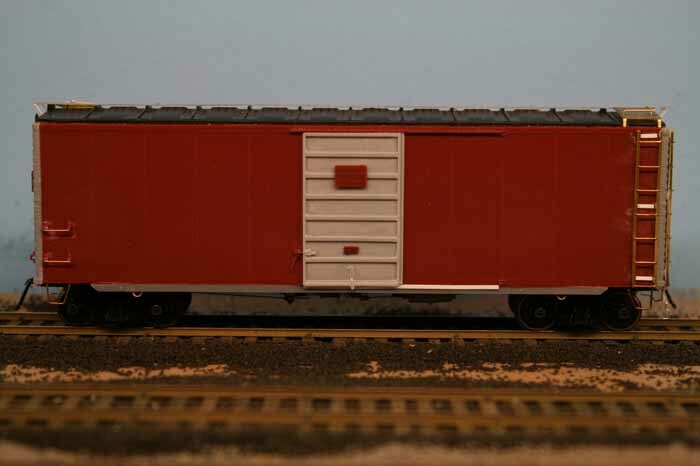 As some of you know I am a custom builder of resin freight car kits. You can see some of my efforts at my website, http://elgincarshops.com/. I have given clinics on building resin kits at different get togethers over the years and much of my personal stuff can be seen rolling at public displays when our Free-Mo modules are out, http://www.casofreemo.org/. It is inevitable that at some point during these events someone will come up to me and say something along the lines of “I’ve looked at those kits, but I’m afraid that I’d mess it up”. This is what I want to talk about. Becoming a good modeler takes practice. Lots and lots of practice. I’ve been building models since I was 5. Over the years I’ve learned many techniques and steadily honed my skills. I read and study what other modelers are doing hoping to glean a little bit more knowledge. The reality is that what I can do today far surpasses what I was doing 20-30 years ago. The best teacher is failure. Learn from your mistakes. The first resin kits I built are in the bin now. They were, by any standard, awful! My execution, not the kit. But as time progressed and I learned more about the medium I was working with, my efforts improved. So much so that now people pay me to do that work for them. I make mistakes all the time. Everyone makes mistakes. Engineers, architects, house builders, etc. We’re all human. The mark of a craftsman is not in being perfect but in rectifying or covering your mistakes, as well as learning from them. The key is to not repeat the mistake. Tools can make a difference. It is a false economy to buy more cheap tools. Tools are an investment, treat them as such. A tool that won’t fail in your hands can do wonders for improving ones confidence level. Also learn how to use your tools properly. You will lessen the chance of failure and reduce the risk of personal injury. Speaking of learning things. Everything one needs to know is written down somewhere. There are books and magazines covering all areas of modeling. And there’s that neat thing called the Internet. It’s all out there, just take the time to read and learn and share ideas. I am constantly astonished at the number of customers who come through the doors of my local hobby shop who seem to refuse to take it upon themselves to educate themselves in the fundamentals of the hobby. They’re new to the hobby and seem to expect perfection at the first go around and then get frustrated when they don’t get instant gratification. Again it takes time to become an accomplished modeler. It also can take an investment. It all costs money and in these economic times we are even tighter with our hard earned dollars. The projects that I’ve worked on and then tossed years later, for me, do not represent a waste of money. I look at it in terms of entertainment value. An average resin kit costs about $35.00 and can take 6-8 hours to complete. That translates into about $6.00 an hour entertainment value for the construction and untold hours of pleasure viewing it when it’s on the layout. How’s that compare to $15.00- $20.00 for a movie or $50.00- $80.00 for a concert or theatre tickets? How far can this attitude go? Three years ago I tore down the layout I had been working on for 7 years and started on whole different project. I had been building a layout based upon Palmerston, Ontario (See Ian Wilson’s article). All the benchwork was built. About 90% of the track was in. Most of the steam locomotives had been acquired and most of the rolling stock was in the house. But something wasn’t right. Every time I went into the layout room I got cranky. There was something amiss but I couldn’t put my finger on it. Then in the fall of 2008 on the way home from another great weekend at the Naperville Prototype Modelers Seminar, I had the opportunity to visit Bill Darnaby’s Maumee Route. What I saw there completely reset my thinking about what a layout can and/or should be. The long runs of mainline on very narrow benchwork really makes the trains the stars of the show. The almost 10 scale miles of track really gives the sense of a working railroad. Most importantly it was a comfortable layout to view and I bet to operate. The drive home consists of my rethinking everything I had been doing to date and what could I now do that fulfill my desires. After a few weeks a looking around and some good fortune with research data, I hit upon a new prototype to model. I am now modeling a portion of the Wabash operation in Ontario. 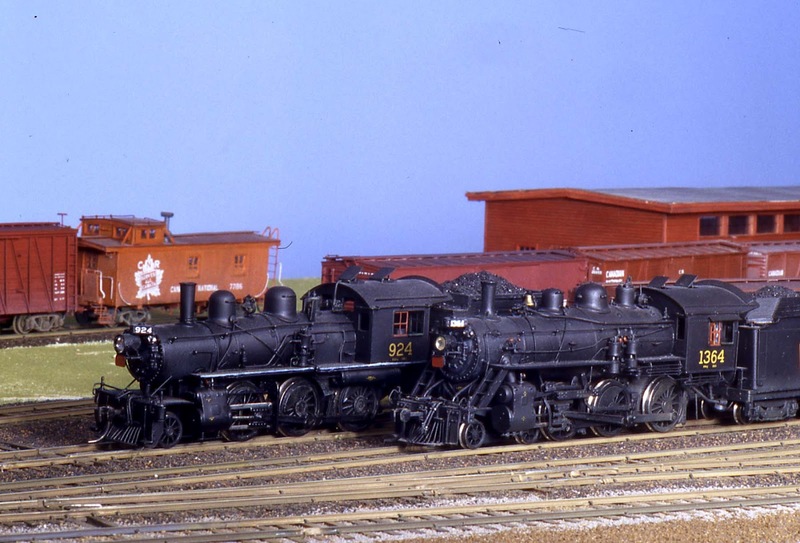 Most of the Canadian National brass models were quickly sold along with a sizable percentage of the rolling stock. Some of the structures went to good homes with my friends. I’ve acquired the needed Wabash engines and am slowly building a new fleet of rolling stock. It was when I started to dismantle the old layout that I discovered the mistake I had made with the Palmerston layout. Actually it was a series of mistakes. I had neglected to follow my own feelings about access. There were too many points on the layout that were hard to reach. The design required a large wye in the middle of the basement which effectively cut the room in half which made getting from one end to the other a chore. Too many things had to be in place and working properly before the layout could be run. The list can go on, but I think you get the point. It was all in all too much layout for one man with my current work schedule. To date work on the new layout is progressing well. And I’m feeling very positive about this new direction. 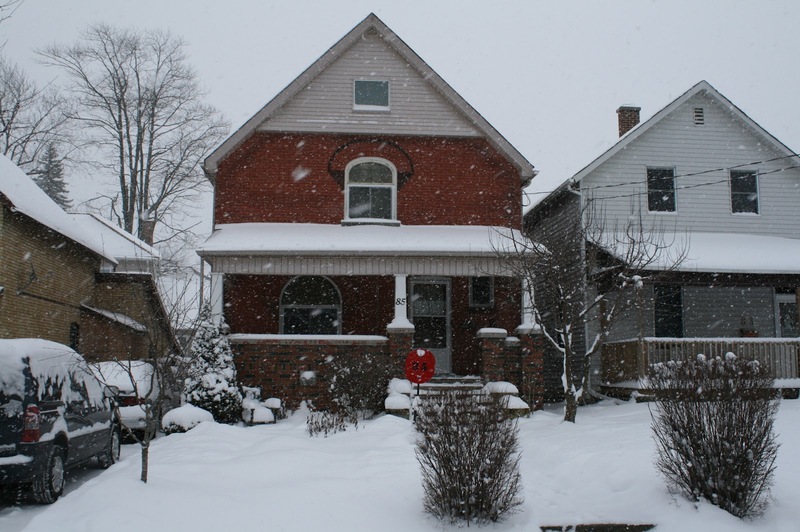 Do I consider the time and effort on Palmerston to be a waste? Not at all. I learned a lot from the exercise. What to do and what not to do. I’m getting an opportunity to work with new products that have recently come on the market, particularly the hand laying track systems from Fast Tracks. I had a good time building the old layout and consider every dollar put in to it a worthwhile investment. The bottom line, don’t be afraid to try something new. You may surprise yourself, at worst you’ll learn something new. The 4 85000 series Wabash rebuilds emerged from the weathering department today. I very pleased with the results. The ladders I scratch built help make these cars stand apart from the other 10'4" IH rebuilds that are part of the Wabash fleet. I've been squeezing personal projects in between work for clients in part to prepare a clinic for this fall's Naperville Prototype Modelers Seminars. Maybe we'll see you there. We've also been very hectic at the John Labatt Centre this past month, (my other work), but now that Cirque Du Soliel is done we have a month with nothing so it'll be full tilt boogie at the work bench. I now have the final parts required for the pilot model of the Wabash Stock Car kit. So I'll be building that and then creating the instructions. I'm aiming for a release date before the end of June. Stay tuned. I currently have 4 Sunshine #64.53 Wabash rebuilds on the bench. 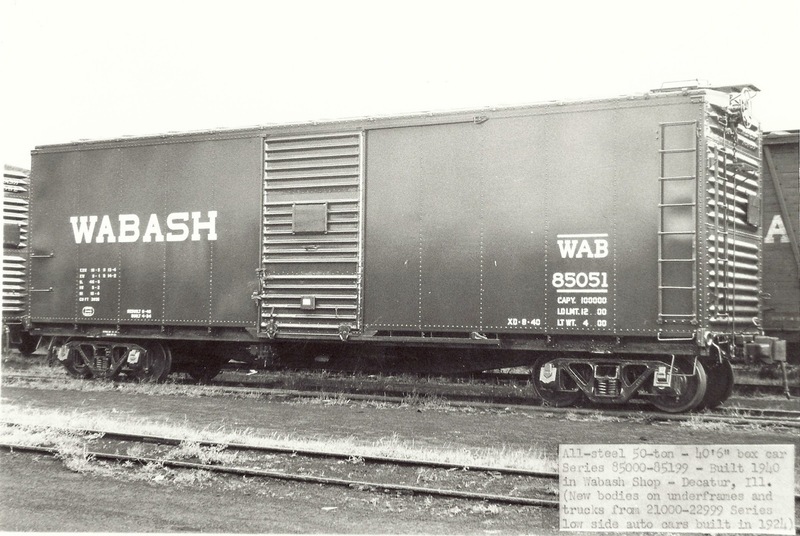 These are representative of some of the many rebuilds that the Wabash undertook during the 40's to help bolster the fleet and get usage out of perfectly good frames and trucks. The 85000-85199 series were a variant from the other rebuilds in that they retained their 50 ton Andrews trucks and they had different ladders than the other rebuilds. Based upon the photo above I took the rung spacing to be 14", rather than the usual 16" or 18". The supplied stock Tichy ladders were definitely not the right rung spacing. I have been enamored with the ladder building technique from the Speedwitch Wabash AAR cars. A photo-etched pair of stiles that you bend to create the angle and then insert commercial straight grabs once the legs are clipped. Solder or glue and they're ready for mounting. However the rung spacing on these ladders were wrong for this project. I posted an impromptu survey on STMFC, and among other things, got a suggestion from Tom Madden how how to create my own ladders. A really simple, but very effective technique. http://www.pullmanproject.com/Ladders.pdf. I spent most of the morning creating the 16 required ladders and mounted 4 on one of the cars. I'm very pleased with the final results. I'm indebted to Tom for this technique. Having said that I'm still going to pursue other options for oddball ladders. With the hopes of making them commercially available. Stay tuned! One of the great things about being a custom builder is that I get to work in scales and with products and kits I wouldn't otherwise get to play with. 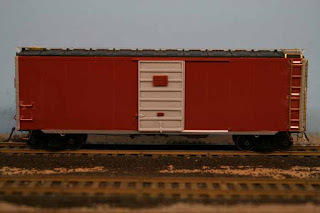 Today I finished up a Chooch ATSF Bx-56 boxcar kit. Proto48 is something to behold. Such detail! And the workmanship that can go into these cars! Jim Zwernneman did the kit design and pattern work for this kit and he really knocked this one out of the park. I've built this car in HO from a Sunshine kit, but this O scale behemoth really shows the uniqueness of this car design. I am in awe of Jim's incredible attention to detail. It is indeed a pleasure to work with products this well designed. Today, on Yahoo STMFC, my friend Bill Welch, started a thread on the history of Prototype Modeling. Among the many things he wants to discuss is the original resin kit makers. People like Al Westerfield, Dennis Storzek and Steve Funaro. All of whom have made a great contribution to the hobby. It's intriguing to me since today, I just finished building and painting a pair of original Storzek kits for a client. These Rutland kits are classics by any definition. While the actual resin is the old epoxy compounds, the pattern work done in the mid 80's remains some of the best modeling ever produced. These old Storzek kits are a delight to work on. I'd also like to mention that I have a few of the Rutland Car Shops stock car kits available. Feel free to contact me if you'd like one. I have a bit of a mystery on my hands. 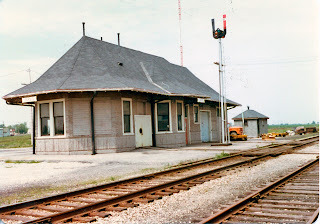 I have been unable to date, to find any photos of the Aylmer station, other than 2 very small ones from the turn of 19th century. I do have a drawing from National Archives of the station and a proposed addition of an express room dated 1920. 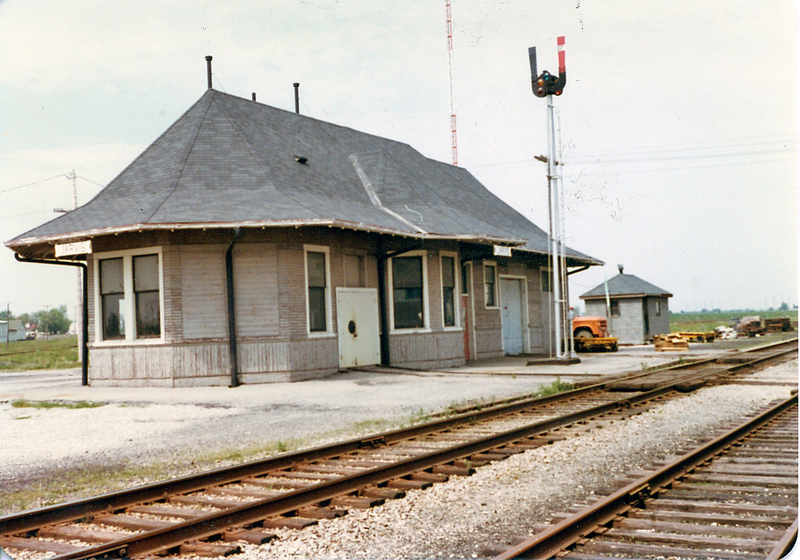 It was a sizable station, similar in size to the Jarvis station further east. Then , through the good graces of a friend who desires to be anonymous, I was given a copy of a real estate map dated 1948 which is marked "No station". And the train order board was relocated to adjacent an elevated crossing tower. The station was located just to the west of where the real estate map shows the tower and train order board. Also the Employee Timetables I have all show Aylmer as a 24 hour train order office, which leads one to believe that the operator worked out of the crossing tower. But the big question for me, is when did the station burn down? That's the only situation that fits the circumstance. The search is on with various agencies. I'm hoping that the station was lost close to my modeling date, 1951, so I can model just the footings. Could be really neat. My good friend, Trevor Marshall, posted the following on his blog today. The whole project was fun. I read something online today that reminded me of one of my favourite memories in the hobby and I thought I'd share it here. We wanted to do something that really showed off the free-form nature of Free-mo and realized one of its strengths is the ability to replicate prototype locations, in a way that other modular forms cannot. This is because with Free-mo, the benchwork can follow the track - including a prototype track arrangement. Other systems force the modeller to work with restrictive modular specifications that make it difficult to capture the feel of most real places. Pierre and I looked for several candidates and settled on a small yard and adjacent industrial park in Peterborough, Ontario. The result was The Peterboro Project ("Peterboro" is how the CNR spelled it). This module consisted of a dozen sections, each a maximum of 60 inches long by 18 inches deep. In total, we had about 50 feet of module: about 27 feet represented the through route, with the balance on a number of peninsulas - including one about 12 feet long which in turn supported its own peninsula. 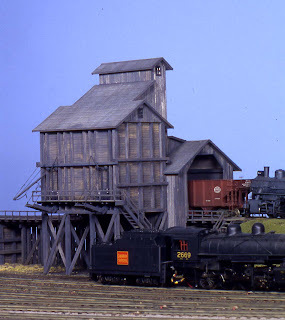 Pierre hand laid the turnouts and produced some great freight cars for the layout. I scratch-built many of the structures. We created two adapters that flared the ends out to the standard Free-mo modular width of 24 inches, so we could connect to other modules. But when set up in exhibition mode, we left these at home and attached a five-track sector plate to one end of the through route. We could then operate the module as a sprawling switching layout. Here's a plan of the module as an exhibition layout. I took photos in the workshop and at a number of events, including exhibition set-ups at a customer appreciation day and barbecue hosted by Toronto-area hobby shop George's Trains, and at the 2007 Toronto Christmas Train Show. And I took some rail fan photos to help illustrate the article in RMC. As should be obvious from these pictures, Peterboro was never "finished" - we planned to add trees, people and details, and the module could've benefited from some additional attention paid to presentation: skirting would've been nice. But even as exhibited in its "work in progress" state, The Peterboro Project received a lot of positive comments, and it's gratifying to see a number of groups that now use Free-mo or Free-mo inspired standards in Southern Ontario. I wouldn't say we introduced the concept, but we certainly gave it a push. I learned a lot through the Peterboro exercise - especially some tricks that are invaluable when building a layout that needs to survive hours of bouncing and bashing in the back of a vehicle. I also learned that I really like sector plates for staging - something I continue to use today. But the best part is Pierre and I spent a lot of time in the workshop together in the summer of 2006 to build Peterboro. And along the way we became really good friends. While Peterboro is now someone else's, the friendship continues stronger than ever. And we can make each other crack up by saying things like "It's a co-op! ", which not even our wives understand. I'm really glad we built The Peterboro Project. The layout has hit the "grind" part of it's life. 90% of the track is in. I have some turnout work in Courtland and Delhi to finish up, and the staging yards for the CN Hagersville Sub to take care of. The really big task now is wiring it all in. Soldering drop feeders and connecting them to the power bus, along with dropping feeders for frog polarity control. Wiring is now complete as far as the west end turnout in Courttland. That includes the liftout section that bridges the doorway. As I was finishing the wiring in the Tillsonburg CPR interchange yard, a short circuit occurred. In my usual thorough fashion I overlooked the obvious as I spent an hour trying to establish the cause of this short. The diamond, which was built with a jig purchased from Fast Tracks, was the source of the trouble. However I still maintain that I had checked it when it was built. Some quick work with the Dremel cutoff wheel restored normalcy. I've chosen to use Fast Track's Bullfrogs for turnout control. They solid, simple and robust. Cheap too! Installation is simple and the system includes linkage components used in RC aircraft. Certainly worth considering. 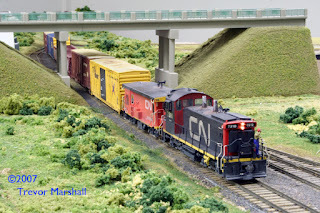 Once I resolved the short in the diamond at Tillsonburg, I ran a test train along portions of the layout that were wired. Where I made a most intriguing discovery. I'm using a Digitrax DCS 100 as a base station, with a DB 150 as a slave for half of the layout. I"m also using PSX4 from Tony's Trains for circuit protection. As the train crossed from the section powered by the DCS 100 to the section powered by the DB 150 a short occurred. A little investigation established that the output voltage polarities of the 2 units is not the same. That is to say Rail A is not the same polarity on the 2 power units. Most curious, but simple to fix. I live in a relatively small community,(25,000) that used to be a major railroad centre. In it's heyday St Thomas hosted 5 Class One Railways and an Interurban. There are few surviving railroad men from the 50's still living here, so I was delighted to meet a fellow who hired onto the Wabash in 1954 as an engineer and is still living in St Thomas. I had Jim Rice over to visit yesterday so he could have a look at progress on my layout. I was thrilled to see the delight on his face as he viewed what I was doing. He was particularly entranced by my fleet of paired F7s, all with correct Canadian numbers. " I ran every one of those engines." he said. I think I'm doing something right. My house was built in 1904 and is in remarkably good condition for something of that vintage. However 2 major jobs had to be done when we moved in 17 years ago. All of the plaster had to come down and get replaced with drywall and the entire house needed to be rewired to meet modern electrical code. So for the first 7 years there was a dumpster bin in the driveway ever summer as I worked through the house room by room. I won't even begin to try counting how many tons of plaster I dragged out of the house, never mind the coal soot I blew out of my nose. (By the way, if you ever doubted the ability of coal dust to get everywhere, pull down the plaster in a house that was heated with coal). As I went along every room was rewired to modern code and inspected by the authorities, so I know where every wire is in the house. Including the smoke detectors that are hardwired in and ganged together, again code requirements. So I am confident in saying that I know what devices are where in my house. Sunday morning one of the smoke detectors started chirping. An indication that it's malfunctioning, odd since I'd replaced them all 2 years ago,(nothing lasts forever). So off I go and purchase 2 new units to replace the suspect pair, the 3rd unit in the basement was working fine. I install the new units and the chirping continues from the main floor unit. I swap that unit with the new unit upstairs, The main floor location continues to chirp. Very curious. I spend an hour on the phone with customer support trying to figure out what is going on. We try a few things, to no avail. Over night I had another idea. This morning I opened up all 3 boxes , double checked every connection. I powered down the circuit and the unit continues to chirp. "How? ", I ask, there's no power? Back on the phone to customer support, another very nice lady suggests I take all 3 units outside and then listen to the house. Remember, as far as I am aware there are no other detectors in the house. I have not installed anything. I hear a chirp from the location of the smoke detector box. Which is right beside the main hall closet. I go into the closet and there stuffed in the back of a shelf is a CO detector that my wife put there without telling me. I really hate technology sometimes.